The sun was shining brightly on the Flight Deck of the Intrepid on Tuesday evening. The World War II Essex Class aircraft carrier houses the Intrepid Sea, Air and Space Museum and is one of New York City’s most popular tourist attractions. 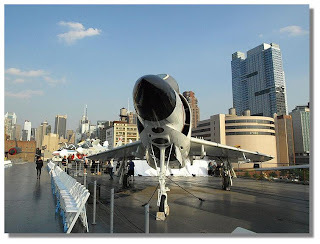 The Flight Deck holds an extensive collection of military aircraft from the US and around the world, including the Lockheed A-12, a reconnaissance aircraft built for the CIA that flew at speeds greater than Mach 3. 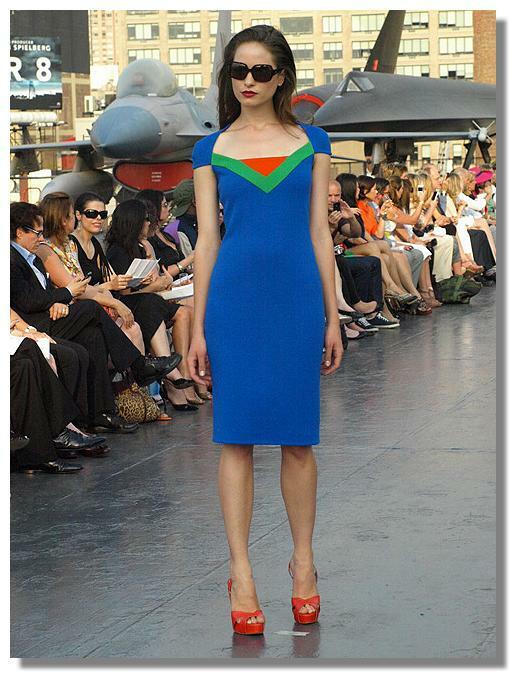 On this particular evening, the Intrepid’s Flight Deck served as the venue for designer Douglas Hannant’s Resort 2012 Collection Runway Show. 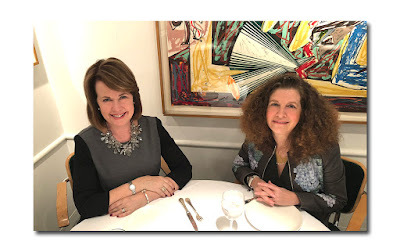 Just after 6PM, guests began to arrive and rather than making their way to their seats in the two rows of white chairs lined up along the deck, most chose to peruse the exhibits while sipping champagne. 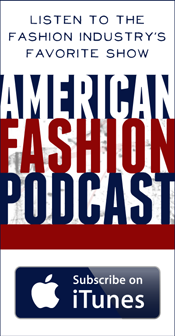 Considering the unpredictable weather that New York has been experiencing this spring, staging an outdoor fashion show was a brave undertaking to say the least. Jill Carles, Public Relations Manager for Douglas Hannant, seemed un-phased by the challenge. “I don’t know if anyone has done a show like this before,” she said, visibly relieved that there was not so much as a cloud in the sky. With the guests finally in their seats, it was time for the show to begin. The familiar guitar strains of Jimi Hendrix’s Star Spangled Banner filled the air, the first of a varied group of musical selections that included songs by The Verve, Fat Boy Slim, The Who, Coldplay, and Phoenix. It was certainly no surprise to see that Hannant’s resort wear was inspired by a nautical theme, what was unexpected was the way in which he transformed traditional elements into a collection that was utterly charming. There were the requisite sailor hats and flare legged trousers, and no shortage of red, white, and navy stripes, but each piece reflected the designer’s signature style, which never fails to make a woman look refined and elegant. 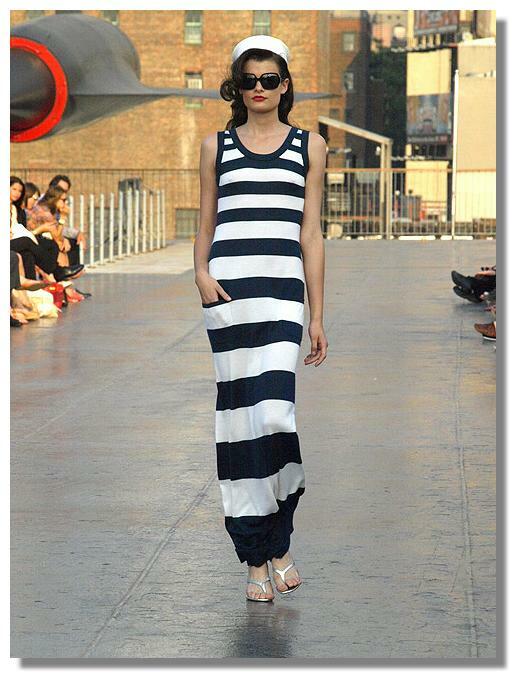 A figure hugging, knit navy and white maxi dress with bold horizontal stripes opened the show. 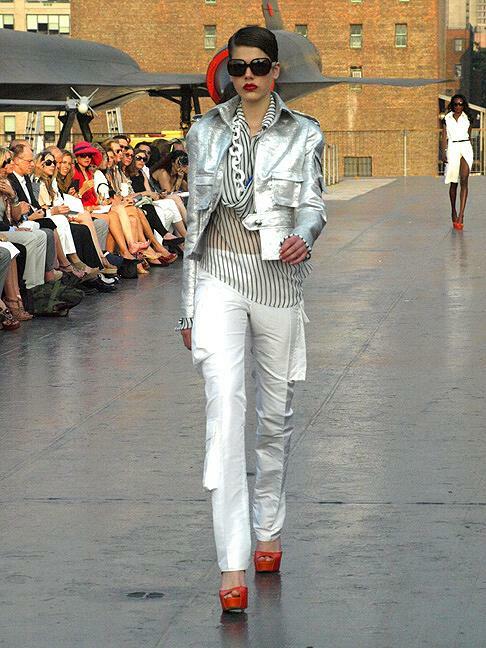 The model wore a sailor hat that looked more like a chic pillbox. Various styles of sailor hats accessorized many of the looks including a navy and white tweed dress with a flattering peplum at the waist. 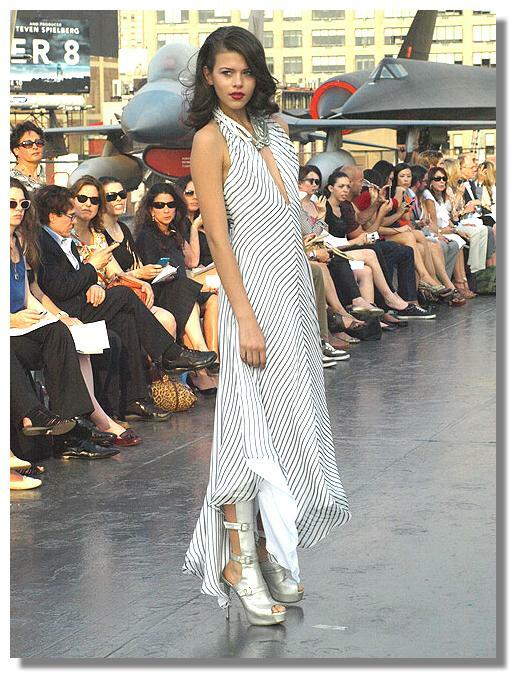 This dress was worn with a pair of coordinating silver platform heels. The chunky soled footwear was featured throughout the show, occasionally in the form of knee-high boots or slip on clogs. A group of boldly colored “flag dresses” punctuated the middle of the show, providing a unique twist on the maritime theme. A sunburst pleated dress in bright orange with a halter top was an unconventional addition as well. 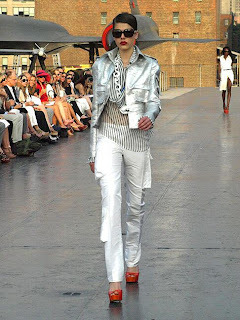 Hannant’s version of the bomber jacket was done in silver tweed and paired with white taffeta cargo pants. 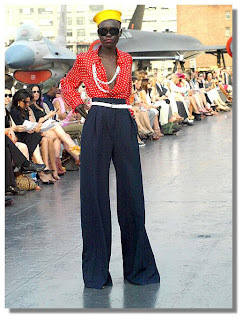 A red and ecru polka dot blouse with high-waisted navy wide legged trousers made a striking silhouette and a pleated sequin tennis skirt looked sea worthy, topped with a white cropped trench. For evening, Hannant’s looks spanned the gamut, from a short navy taffeta pouf dress to a red and black plaid gown, slit high on the leg. A navy and white embroidered ostrich gown, with a voluminous skirt, closed the show, floating down the deck of the Intrepid as the sun began to set over the Hudson River.